In Nepal, in the wake of the 2015 earthquake the work of volunteers has been needed more than ever. After seeing the impact of the earthquake, young Nepali volunteer Preity, 25, decided to volunteer in her home country with sustainable development charity Raleigh International. Preity worked with international volunteers on a house-building project (2015). 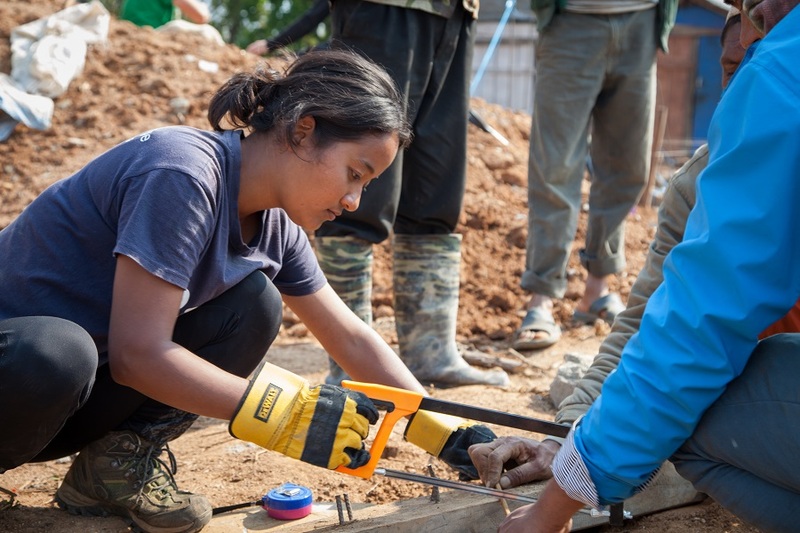 Many people in rural communities in Nepal have been living in cramped conditions in temporary shelters for the last two years, so Preity decided to volunteer to help build earthquake resilient homes for earthquake victims. Preity said, “After the devastating earthquakes hit Nepal in 2015, communities near the epicentre of the earthquake suffered a massive loss of lives, houses and livelihoods. Many people from the epicentre district of Gorkha needed support to start their life again, as they are not financially strong enough to build a new house for themselves. My team of volunteers helped to build three houses in three communities in the rural villages of Baltar, Chapthok and Adhikari Gaun. We worked alongside a local project partner, Build Up Nepal, and learnt from the local women’s committee about techniques for building earthquake resilient houses. We spoke to the people receiving the houses, and they all seemed so happy to be having a concrete house for themselves and were really grateful of the opportunity to work with young people from all around the world. One of the community members who benefited from the volunteers’ house-building project was Jureli, a single mother of six living in Kotdada. Before the volunteers arrived, Jureli was still living in an earthquake-damaged house with her 10-year-old daughter. She was in considerable debt from paying for the construction of her last house, which was built only one year before the earthquake. She had been struggling to get help to build her new house, which she felt was due to her poverty and low caste, as well as her low social status as a widow. Raleigh volunteers like Preity worked with Jureli, helping to lay the foundations for her house and finishing soiling in preparation for cementing and bricklaying. By working to rebuild Jureli’s home, the team of volunteers are transforming life for Jureli and her children and are providing a home which is safer from earthquakes. The importance of having strong foundation earthquake resilient houses provides a long-term benefit to the community. We made three earthquake resilient houses for each community. By working with each community we’ve created sustainable change, as community members now understand the method of making earth bricks and have been provided with brick making machines, so they can continue to rebuild. Raleigh International volunteers aged 17-24 and volunteer managers aged 25-75 work on long-term projects that address the UN’s sustainable development goals and seek to end poverty in rural communities. Raleigh has over 30 years’ experience engaging youth for positive change, and more than 42,000 alumni in over 90 countries.